Jake Marcionette gives an hour presentation and shares his story of success to inspire kids to love reading, writing and act on their own passion. Jake's presentation is motivational and high energy! 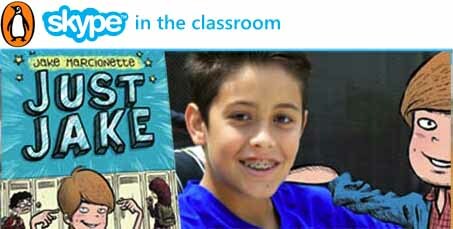 Jake will virtually visit your classroom for a 30 minute Skype visit and discuss his new book Just Jake, his love of writing, how he landed a literary agent and a book deal with Penguin Publishing. "Yes, and the session was terrific! Jake is clearly an expert on Skype calls. He took control of the conversation, shared lots of great information and left time for questions. My kids were so inspired that many of them now want to publish their own books. As soon as we hung up, they started to write. Please send our thanks to Jake. He was great." "Not only was Jake inspirational, a ton of fun and very entertaining but he also inspired our kids to look at their goal and think about what they want to do and find their passion to make it happen. You're going to love him too!" "Please convey our gratitude for Jake who has given our students the opportunity to have a chat with him.... The event has just given me a good problem. Our studentsare now eager to buy the Just Jake book, which is pretty hard to find here in Palembang.... It's good though, because it grows our students interest in reading." "It was great!!! He is so entertaining and very articulate! The kids enjoyed him so much! We are pumped to do another one again with you! The kids stated that if he publishes #2 they want to Skype again!!" "We had a great Skype lesson with Jake this morning. He was terrific and quite inspirational for the students. They thoroughly enjoyed it. I was particularly impressed with the way Jake spoke to the students and the way he related to them too. It was just 'awesome'!"